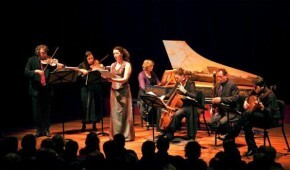 Founded in 1992, Amsterdam’s Apollo Ensemble made its American debut with Pro Musica Hebraica in 2009. They have gone from strength to strength since then and are in demand internationally for their important contributions to the presentation of Jewish Baroque music. The group returned with some rare treasures from the Etz-Chaim Library in Amsterdam, which houses a splendid collection of Jewish music spanning several centuries. Ton Koopman, founder of the Amsterdam Baroque Orchestra, was so impressed with the dedication and work of the Apollo Ensemble that he agreed to reconstruct and complete three works never performed works from the Etz Hayim collection: Boi b’Shalom by Lidarti, Le-el Nora by Mani, and Kol Haneshama by an anonymous composer. Other works performed in this unique concert were by Salomon Rossi, Marco Uccellini, and Giacobo Basevi Cervetto.